Coffee makers are almost as irressible to us as new gadgets from Apple. Over the years, we have sampled our share of coffee machines. We generally favor coffee from machines that grind the coffee just prior to brewing, but have been impressed with Nespresso coffee when we reviewed Le Cube a few years ago. 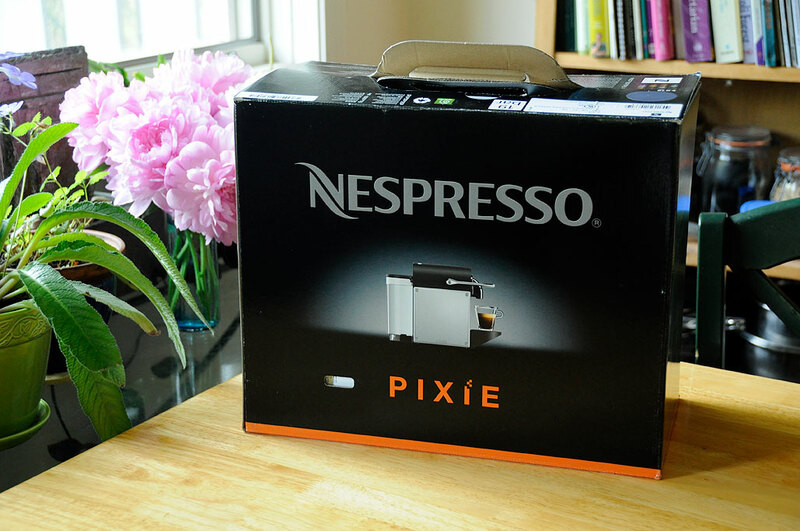 So when Nespresso came out with the Pixie, we were eager to take a look. The machine feels solidly made. The side panels come in a variety of colors, a nice touch for those who like to color coordinate their appliances with their decor. The machine itself is simple enough to operate. There is just a Power button and an amount selector. The water canister may be filled directly or removed and brought to the source. It holds about a liter of water, enough to make about ten cups before a refilling, which is just about the capacity of the used capsule container. The Swiss Nespresso system (produced by Nestlé Nespresso S.A.) has been around since the late 80’s, particularly in Europe, where it has enjoyed a loyal following. The sytem is based around a patented, foil-sealed proprietary capsule that contains ground espresso coffee. Nestlé is the only source for these capsule. So if you want this machine, you have to buy your coffee from Nestlé. This trade-off of convenience over choice may be a deal breaker for some, but a non-issue for others. As for convenience, making an espresso could not be easier. To make an espresso, drop in a capsule, lower the lever, and press a button. Everything else has been automated. Lifting the lever for the next capsule will automatically eject the previous capsule into the waste collection bin. We noticed a few other nice touches designed into the machine. The platform may be tipped up to accommodate taller cups when using the cappuchino-making attachment. The platform also doubles as a handle for pulling out the used capsule container. If you are looking for something stylish, then this eye-catching little dynamo may be exactly the unit for you. The overall footprint is very small. It will be a sleek addition to any kitchen, apartment, or office cubicle. We should have the FirstUse write-up available before the end of the month.